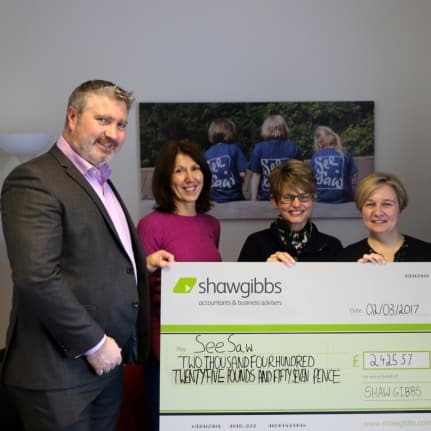 Shaw Gibbs has raised £2,425.57 for its Charity of the Year, SeeSaw. The funds - which were presented to SeeSaw by Shaw Gibbs’ Managing Director, Peter O’Connell – have been raised over the last twelve months from an array of activities organised by Shaw Gibbs employees. Peter O’Connell commented, saying; “Before we chose our Charity of the Year, the whole Shaw Gibbs team watched a video on the work that SeeSaw do. Looking round to see the reaction of our employees, it was clear that SeeSaw was the perfect charity to support in the coming 12 months. The unique work that they do with young people in the community is truly inspiring and we are proud to support them”. Shaw Gibbs raised the money through a variety of activities. A large percentage of the funds came from the Shaw Gibbs Annual Rush Hockey Tournament, in which a number of professional firms from Oxfordshire competed for the coveted trophy. Other fundraising activities included; auctioning Christmas hampers and reception flowers, as well as putting a small cost on all personal deliveries to the office in the lead up to Christmas. The team at SeeSaw have a number of ideas on how best to use the donation. In particular, the charity will look to invest the money into training their volunteers. From this, the volunteers will be able to work directly with children and young people and help to grow the charity. Headington-based, SeeSaw began in 2000. The charity provides grief support for young people - and their families - who have lost a parent, sibling or carer. SeeSaw can offer support through home visits to families, activity days and events, along with information and training to school staff. Members of the public can support SeeSaw through community and school fundraising, corporate support, and volunteering. If you feel you could support the charity then do contact Jane Elliott on 01865 744768 or via email at fundraiser@seesaw.org.uk.